The Unit Powertrain team this year was tasked with designing and fabricating a removable unit which would hold the engine, rear wheel, and all other components required to get the vehicle moving. The unit powertrain is planned to be made of steel pipes, and a stress analysis was done under this assumption. In the fall semester, the Unit Powertrain team was primarily focused on the design and configuration of the powertrain assembly. 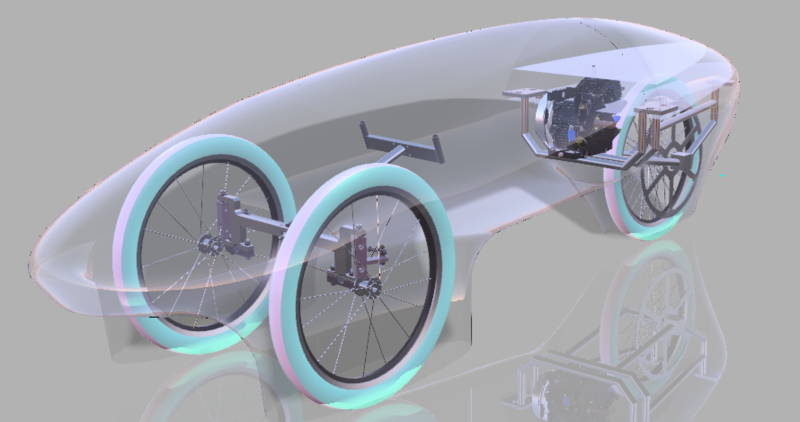 Using the team’s expertise with engineering software, a CAD model was made and analyzed with Fusion 360. Factors of spacing were considered, as the center of gravity must be kept low for the tilt-test but all components must fit. Working closely with the body team as they finalized the size and dimensions, the general configuration was adapted into the current design. After the design was finalized, a mock-up was created with square, 1” diameter wooden dowels and wood glue. This model is used for size conceptualization, rather than weight, so the wood model was a simple solution. With this model, other teams along with the powertrain team can re-design for spacing issues if necessary. In the spring semester, the Unit Powertrain team plans to fabricate the finalized model with steel pipes. Upon its completion, the Unit Powertrain team will assist other SMV teams as needed.